Wild salmon is not only a nutritional powerhouse — it’s also extremely versatile as a clean protein, which makes it an optimal way to kickstart your day. 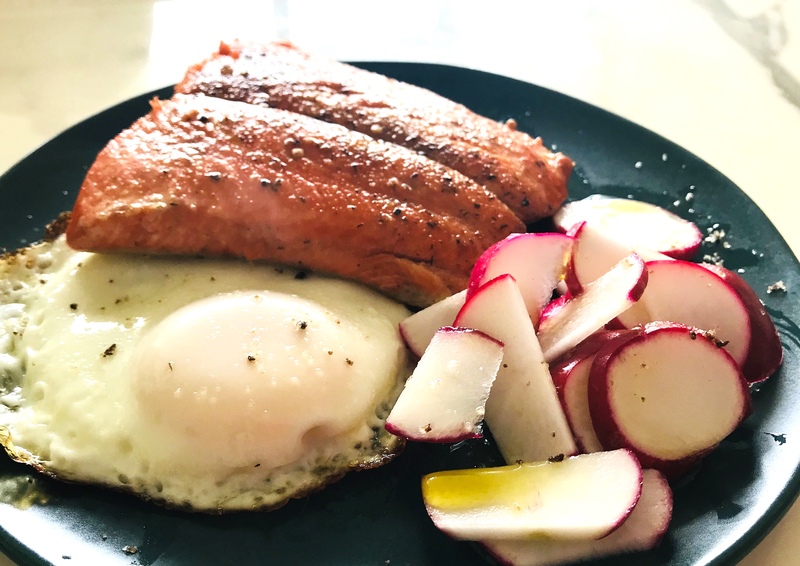 While wild salmon is more than suitable for meals any time of the day, but packing high-quality protein and fats into breakfast is a great way to ensure you’re getting your daily dose of nutrition no matter where the rest of the day takes you. Make a few extra cups of green tea in the morning — this is your poaching liquid for your wild salmon. Topped with a poached egg, miso hollandaise, and served atop broccoli fritters rather than English muffins, this is the most luxurious twist on salmon benedict that we’ve ever seen. A simple salmon scramble is a great way to utilize leftover salmon from the fridge. If you’re making this one from scratch, leave the salmon on the rare side before adding in eggs so that everything is perfectly cooked when the final dish reaches your breakfast plate. If you didn’t think salmon on a bagel with cream cheese could get much better, you’ve been mistaken. Seriously up your breakfast bagel game by opting for wild salmon rather than the farm-raised stuff. This combo is so easy that even young kids can make it. This gluten-free recipe is a great go-to when you don’t have the time or energy to fuss over breakfast. Use leftover salmon or even canned salmon to make these crispy patties. Frittatas are one of the most versatile breakfasts: they can be served hot, at room temperature, or even straight from the refrigerator. Use either fresh or leftover salmon for this recipe. Keep baked salmon and taco toppings on hand to make breakfast tacos an everyday thing. All you have to do is add freshly scrambled eggs to the mix and you’re good to go. If you’ve got a cured fillet of wild salmon on hand, mince it up with a knife or in a food processor. Add a few other yummy ingredients, then stuff it all into the center of half an avocado for an easy, ketogenic breakfast. Home chefs who aren’t afraid of making a simple pastry crust will love this recipe for a nutty, creamy, salmon and veggie pie. Make a big one on Sunday morning. If it’s even possible for you to have any of the pie leftover at the end of the day, know that it keeps nicely in the fridge and can be served up cold or reheated over the next few mornings.